Nationwide and around the globe, communities are facing an increasing number of tragedies involving active shooter and/or hostile events. The need for an integrated preparedness, response, and recovery program is greater than ever before. 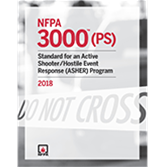 Protect your community with NFPA 3000™ (PS). This standard addresses all aspects of the process, from identifying hazards and assessing vulnerability to planning, resource management, incident management at a command level, competencies for first responders, and recovery.